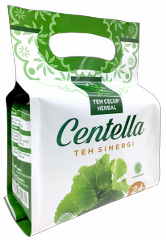 Tea with main ingredients of Centella asiatica synergized with other herbs such as bay cedar, red ginger, and green tea, which are processed according to production standards for tea drinks, resulting in a distinctive taste and sensation. Centella asiatica, green tea leaves, bay cedar leaves, red ginger. Soak 1 teabag into 1 cup of hot water.